Combine all ingredients in a sealed bowl or zippered bag. Marinate for 24 hours. Place the chicken into a 3-qt baking dish and cover. Bake for 25 minutes. Remove the cover and bake an additional 10 minutes. Broil chicken for 6-10 minutes to brown and crisp the skin. Enjoy with your favorite greens—we chose sautéed spinach. 1. Combine all ingredients in a sealed bowl or zippered bag. Marinate for 24 hours. 2. Preheat the oven to 375º F.
3. 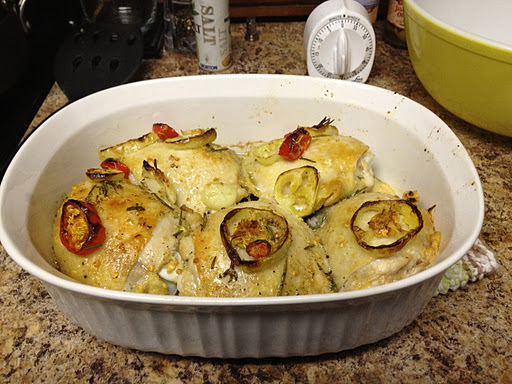 Place the chicken into a 3-qt baking dish and cover. Bake for 25 minutes. 4. Remove the cover and bake an additional 10 minutes. 5. Broil chicken for 6-10 minutes to brown and crisp the skin.